Ever have those days when your kid just needs to eat, but refuses to eat anything you put in front of them? We’ve had that kind of month. But lately I’ve been finding myself on the edge of locking into a battle of wills with the kids at mealtimes over trying new, and sometimes even well-known-to-them, foods. Our kids aren’t generally picky eaters. For the most part, they’ve been pretty open to tasting new foods. However, lately they’ve been in a phase where they think it is hilarious to declare lots of foods yucky, even foods they devoured the day before (which the experts say is normal). And they play off each other brilliantly. As soon as one declares a dish yucky, the other jumps on board and refuses to eat it, too. Even if she’d been practically inhaling it 10 seconds earlier. I don’t mind them choosing not to eat any given food at any given meal. But I do greatly mind them declaring a dish yucky without actually trying it. And as the primary cook in our family, I’m particularly interested in expanding their tastebuds – plus, B and I are real foodies. So I started pushing them to at least try whatever was being served, to see if they liked it. Not surprisingly, they started pushing back, refusing to taste whatever I was pushing or, worse yet, licking it or taking a pinhead sized amount, then sticking out their tongues, screwing up their faces, and declaring it yucky. The cycle repeated itself meal after meal. After a few weeks of this, B commented that our family mealtimes were starting to feel a lot like the unpleasant, nagging-laden type of interactions we’d adopted the division of responsibility to avoid. I agreed. But we still wanted the kids to taste the food on each meal’s menu, especially new foods. We didn’t want to punish them for not trying dishes or reward them for trying food. To preserve a kid’s healthy relationship with food, the division of responsibility counsels strictly against both forcing kids to eat even one bite and using food as punishment or reward. We wholeheartedly buy into that. So I felt kind of stuck. What to do? When a few meals later the kids once again balked at my request they taste something, I told them about the “I Tried It Box,” something I had read about on the Six O’Clock Scramble (great resource for quick and easy family meal planning!). The idea is to label a shoebox the I Tried It Box and let the kids write on a piece of paper any food they eat and then stick it in there. I told our kids that anytime they tried a food, whether they liked it or not, they could drop its name into their I Tried It Box. 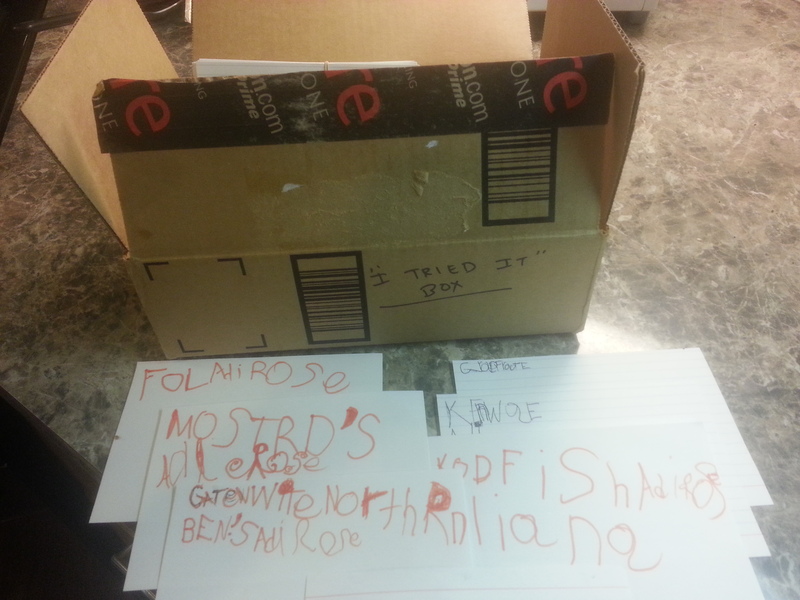 We re-purposed a small cardboard box, and gave them index cards to write food names down on. Much to my surprise, it worked! Our kids loved the idea, our kindergartener especially because she gets to practice her writing at mealtime (markers and paper aren’t normally allowed at the table). For the last few weeks, simply saying “you can put it in your I Tried It Box” has been enough to get them to try almost anything. They’ve even asked to try foods they previously shunned – a variety of mustards, B’s favorite Middle Eastern fava bean dish (ful medames) – just so they could put it in their I Tried It Box. It’s been amazing. Using the I Tried It Box, I’ve even persuaded them to hold off sharing their opinion about a new food until each has tasted it, so they won’t influence each other’s willingness to taste something. They’re discovering that sometimes they agree about taste and sometimes they don’t, and that that’s okay. So even though the kids still aren’t eating everything we put out, and still are declaring lots of things yucky, the stress is once again gone from mealtimes. I don’t know why the I Tried It Box works (or how long it will work), but it does and we’re sticking with it. Do you have picky eaters? Are your normally easy eaters suddenly refusing to eat what you serve? How do you get your kids to try new foods? So glad the “I tried it” box is working so well for your family. It’s true, once in a while we need to try a new tactic until one day you wake up and the kids are eating everything you put on the table and you know you have made it! (I finally hit it this year).